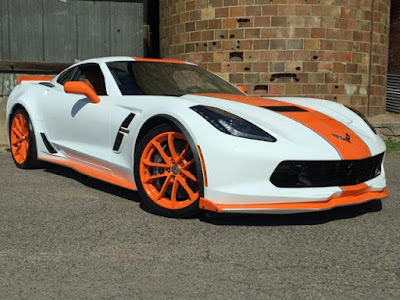 Have you seen Purifoy Chevrolet's latest custom Corvette? This 2017 Chevy Corvette Grand Sport 2LT is gorgeous in gleaming Arctic White with orange and silver accents. Orange accent stripe with smaller silver striping down center, plus front and side skirts have silver and orange accents to really make this Corvette stand out! Now, our amazing Body Shop has added on matching orange rims that look incredible! Visit Purifoy Chevrolet, just down the road from Denver, to see this beauty in person! This is custom so you will not find another like it. Isn't it time to drive a vehicle as unique as you are?